The hard drives from both of these laptops were severely damaged in a multi-car wreck. Despite the damage, the data was fully recovered from both laptops. 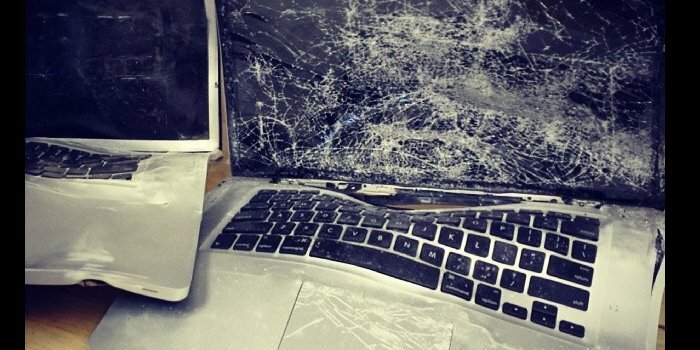 My home and business MacBook Pro laptops were destroyed in a wreck, when the bag they were in was thrown from our vehicle and lodged between two semi trucks. It looked like there was no way to recover the data but ACS Data Recovery was able to recover everything from both, terribly damaged MacBook Pro laptops. They are professional, attentive to your needs and provide outstanding customer service. By far the most common problem we see when it comes to laptop data recovery is due to some sort of impact. We’ve seen drives that have been in laptops that were dropped off a desk, run over by a car, and in one case the laptop actually fell from the top of a 60-story building. The next most common issue would be damage resulting from spilled liquids. These typically short out components and it is quite common for the liquid to actually make its way inside the hard drive. Has Your Laptop Suffered Any Of The Following? ACS Data Recovery can help retrieve your data in any circumstance. Our laptop data recovery services are backed by one of the best guarantees in the industry. We never charge an evaluation fee, and in most cases there is no charge if the data is unrecoverable. We offer our services 24/7, 365 days a year. 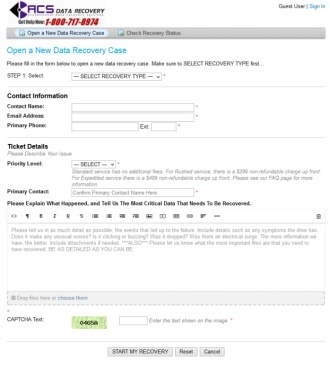 The first step in getting your data recovered is simply giving us a call at 1-800-717-8974. You can speak with a representative who can help diagnose your problem right over the phone, and give you an accurate quote. We try to avoid giving our customers huge price ranges when we quote them for laptop data recovery services, but sometimes the symptoms may not be as serious as they sound. Once you’ve received a quote, you would simply Create A New Data Recovery Case and ship your laptop’s hard drive to the address given. For laptop data recovery services, we only need the hard drive itself, not the entire laptop. So you would just need to have the hard drive removed if possible. If that is something you don’t feel comfortable doing, or you don’t know of anyone who can help you remove the drive, then by all means send it in and we will do it for you. Package your hard drive with multiple layers of bubble wrap, and place it in a well fitting box. Ship the drive to our Temple, Texas address. Once we receive the drive we will enter your information into our ticket system and begin the evaluation. The initial evaluation process is completely free. When the evaluation is completed we will update you and confirm the cost of data recovery on your laptop hard drive. At that point you can simply elect to proceed or decline. There is absolutely no charge for this initial evaluation. 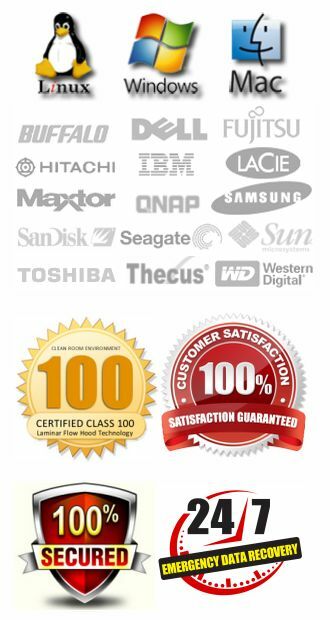 Our initial evaluations are free for laptop data recovery services and all other media we work with. If you decide to proceed, most recoveries require about 5 to 7 business days to complete. If you need your job Expedited, we offer much quicker turn-around times with our Rushed and Expedited service levels. After we have your data recovered, we will place the data on a brand new external hard drive and ship it back to you. We work on ALL brand and style laptops. It doesn’t matter what type of hard drive it has. We even get SSD (Solid-State Drives) that have come out of laptops. The brand of the laptop or the hard drive doesn’t matter to us. In most laptops you will have either Seagate, Hitachi, Fujitsu, Toshiba or Samsung hard drives. We can work on any of those. Chances are you keep everything from family photos, to business files, maybe your address book, and even personal financial information stored on your laptop. If you haven’t been backing up your data redundantly, then you might be at risk for losing your information should a serious hard drive crash occur. There are times when our laptop data recovery services cannot help. Especially if severe platter damage occurs. It’s a good idea to have a good backup plan for your data in place at all times. Take a moment to read this article over on the Dell website: Laptop Hard Drive Failure Prevention 101. It offers some very good points on keeping your data safe. If you have suffered a hard drive crash, and need laptop data recovery services, please don’t hesitate to contact us at 1-800-717-8974.